Birth & up. 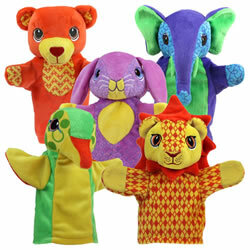 These plush little friends with soft fabrics and embroidered faces are sized perfectly for infants and toddlers! 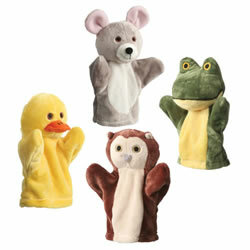 This set includes a Frog, Duck, Mouse and Owl hand puppet. 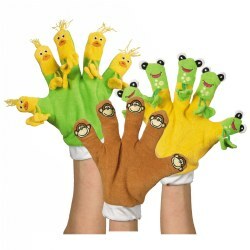 Each puppet is approximately 5 1/2"H. Machine washable. Puppet features may vary from those shown. Birth & up. 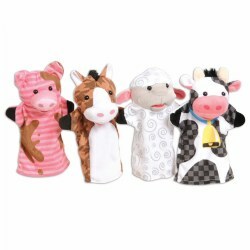 These plush little friends with soft fabrics and embroidered faces are sized perfectly for infants and toddlers! Each puppet is approximately 5 1/2" high. Machine washable. 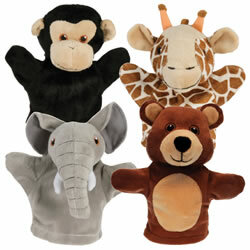 Set includes monkey, giraffe, elephant, and bear puppets. Birth & up. 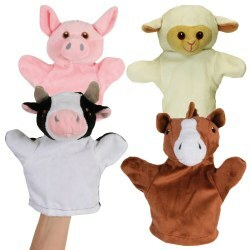 On the farm or in the classroom, this set of farm-themed puppets will bring smiles and giggles to the youngest of faces. 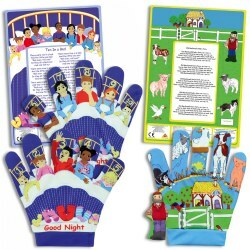 They are squeezable soft, have embroidered features, and are machine washable for easy cleanup. 18 months & up. 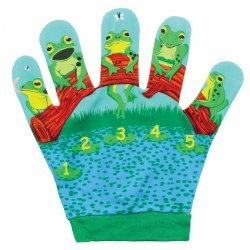 These three storybook favorites, 5 Little Frogs, 5 Little Ducks and 5 Little Monkeys will come to life when you put them on your hand. Complete with 22 rhymes and finger play activity cards. Machine washable. Birth & up. 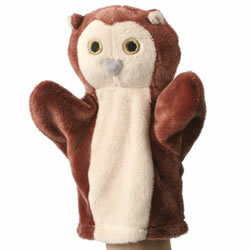 This plush little owl puppet is made with soft fabrics and an embroidered face. It is sized perfectly for infants and toddlers! Measures 5 1/2"H. Machine washable. Puppet features may vary from those shown. Birth & up. 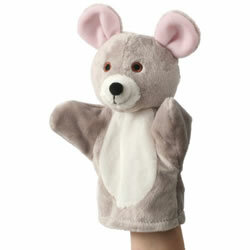 This plush little mouse puppet is made with soft fabrics and an embroidered face. It is sized perfectly for infants and toddlers! Measures 5 1/2"H. Machine washable. Birth & up. 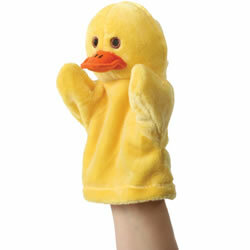 This plush little duck puppet is made with soft fabrics and an embroidered face. It is sized perfectly for infants and toddlers! Measures 5 1/2"H. Machine washable. Birth & up. 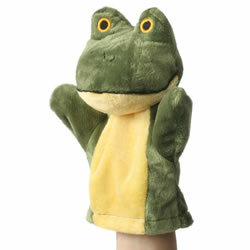 This plush little frog puppet is made with soft fabrics and an embroidered face. It is sized perfectly for infants and toddlers! Measures 5 1/2"H. Machine washable. Puppet features may vary from those shown. 12 months & up. 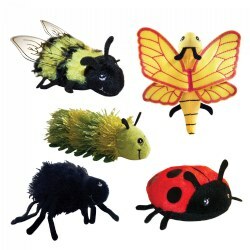 Set of five finger puppets represent some of the most common bugs you would find in the backyard. 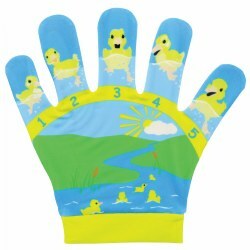 Each has an elastic fitting inside to keep them on your finger and are great for hours of creative play. Includes bumblebee, butterfly, caterpillar, spider, and ladybug. Bugs have full bodies and measure 6" high. 2 years & up. 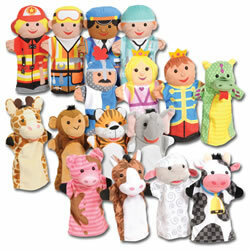 Community helpers with friendly faces, fantasy palace pals, and a selection of farm and zoo animals make up this large set of puppets suitable for the beginner puppeteer. 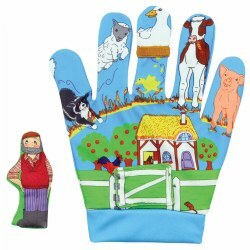 Enriches imaginative play and makes the perfect visual props for supporting nursery rhymes and favorite classroom stories. 16 puppet set. 12 months & up. 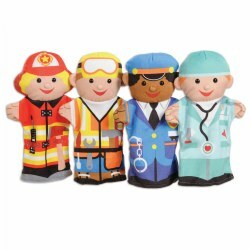 Each set of 4 delightful puppets will engage children's interest while expanding language skills and creative expression. 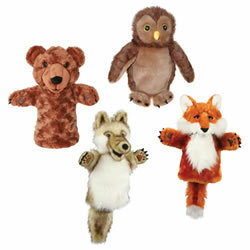 This set includes a Fox, Wolf, Owl and Bear hand puppet. Each puppet is approximately 8"H.
12 months & up. 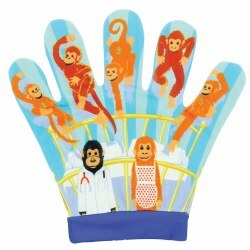 Each set of 4 delightful puppets will engage children's interest while expanding language skills and creative expression. 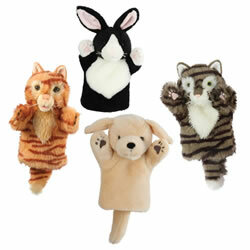 This set includes a Yellow Labrador, Tabby Cat, Ginger Cat and Black and White Rabbit hand puppets. Each puppet is approximately 8"H. Puppet features may vary from those shown. 12 months & up. 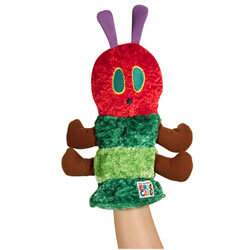 Huggable 11" caterpillar puppet features soft tactile body with large expressive facial features. Use with The Very Hungry Caterpillar by Eric Carle, or enjoy alone. Surface washable. 2 years & up. 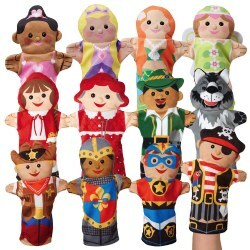 Great for storytelling and imaginative play, this set of puppets includes all your favorites: fairy tales, storybook friends, and superheroes. Machine washable. 12 months & up. 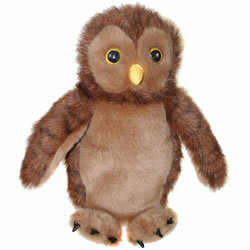 This delightful woodland owl puppet will engage children's interest while expanding language skills and creative expression. 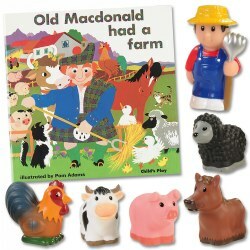 Great for storytelling and pretend play. Measures 8"H.